Have You Put The Turkey On? 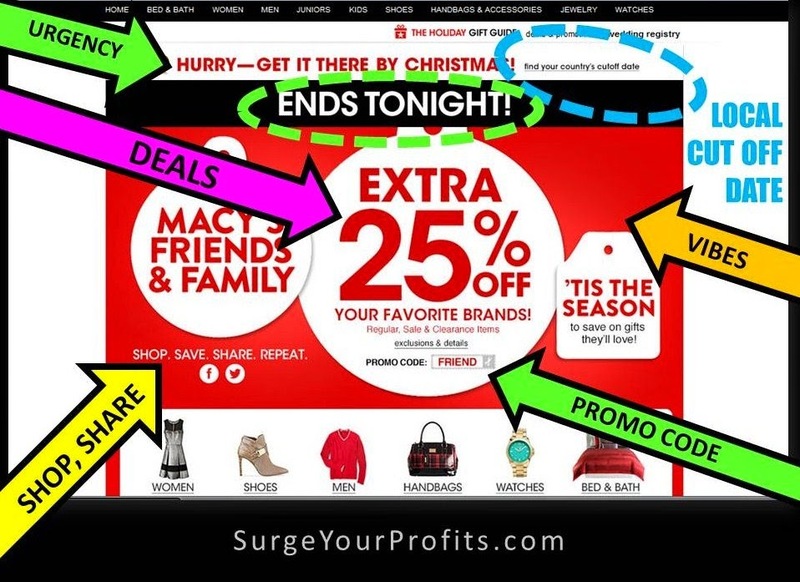 Now that Thanksgiving is over it's time to focus on boosting Holiday Sales. Try giving away a Freebie eg. $5 gift cards (loss leader strategy) to lure shoppers into your store. Increase your credit facility to hold and offer more stock (the kind that you have researched will be in demand this seasaon). Extend this benefit to your customers by increasing credit and payment options eg. extended laybys, 6-month free credit, in-context credit (cf. prevents shopping cart abandonment and increases conversions), etc. Increase staffing and stock levels to expected, projected sales targets. Plan this well and well ahead of peak shopping period so you don't run out of stock and miss out on potential sales. Online Store Tips: Don't forget your online stores, eg. offer free shipping, free gift, gift cards - yes, gifts are more effective than coupons! Align your brick-and-mortar store with your online webstore ie. be consistent (acoss ALL channels), and no, many retailers are not up to scratch. How many times have you tried to check out a certain product on a Webstore before you visit their Brickstore to purchase but was unable to locate that on their webstore in the first place (except for Amazon!) let alone find consistency in deals and offers? The aim is to drive traffic from your Webstore (and your Social Media accounts) to your Brickstore and vice versa in a continous loop to leverage this traffic because it means more overall traffic (leading to more sales) at a lesser time, effort and financial cost. Keep your website attractive and mobile-friendly. Test holiday themes to see which feel-good factor put shoppers into the mood (for shopping, reviewing and sharing). Enable mobile payment wherever possible (imperative). Hit Your Mailing List. Email your list with the Holiday Specials you are offering. You need to do this even more if your store is small. Start collecting this diamond-data by giving away free gifts, draws or other incentives using fill-out cards that ask for their details. Or simply but sweetly ask your shoppers for their emails at the checkout to make a flying start at list-building. Even some big tech stores fail at this and therefore miss the chance to leverage further sales. Not so this savvy, online store; also note their international shipping (popup) offers when international surfers visit. If you don't ask you won't get! Then remember to keep mailing offers to your list - have a new one every few days / per week. You may even sprinkle storewide, short specials or 'daily deals', eg. 30% savings for 24 hours only, among your other longer offers (even if this is not the norm for you). Combine this emailing with Facebook Ads for more sales (proven method). Amplify your digital reach by broadcasting on other social media: Twitter, Google+, etc. Point to rich, detailed PICS of your offers on your Pinterest Boards in your broadcasts. Ask shoppers to recommend friends and family to your store by word-of-mouth and by social media. Reward them with small freebies eg. gift cards, for promoting your offers. Respond FAST to sales enquiries. Make prospects wait over 24 hours at your own peril. Their attention span is short and their loyalty shorter especially if your brand has no USP. Yes, use a savvy & multi-channel approach (eg. joint venture projects - mailing your offers to other people's lists, using banner ads on other people's networks, etc.) in your marketing efforts. And continue to test and analyse results to optimise your budget and effort. Embrace the spirit of the Season for you and your shopper's experience. Keep it FUN and bright? Literally, light up your store. A festive ambience is more congenial for longer browsing and shopping. No pushy salesperson tactics so strike a happy middle-ground - first-class, sales service and intelligent, cross-selling without the aggressive, hard-sell? Painless, swift refund policy? The more transparent this is on your website and instore, the more confident your buyers will be especially with big-ticket items. Treat your staff well, the way you would your buyers as this always filters through. Queen Bee Shopper: Mother is an important decision-maker and / or influencer in the family unit. She needs to buy INto your brand if she is to buy UP your store offers. •Note the generous, gift-set "Free Shipping" and "Free Returns" terms with TOP & PROMINENT PLACEMENT well above the fold, cf. red arrows. Gift-sets are incentivising to a prospective buyer as they offer more (value) for less (than the cost of individual items in the set) and does all the cross-selling and up-selling weight-lifting for the vendor passively. Check this out with your own experiences, did you ever need a salesperson to 'twist your arm' to buy a gift-set that offers tremendous value especially if comes with other bonuses and / or free shipping? 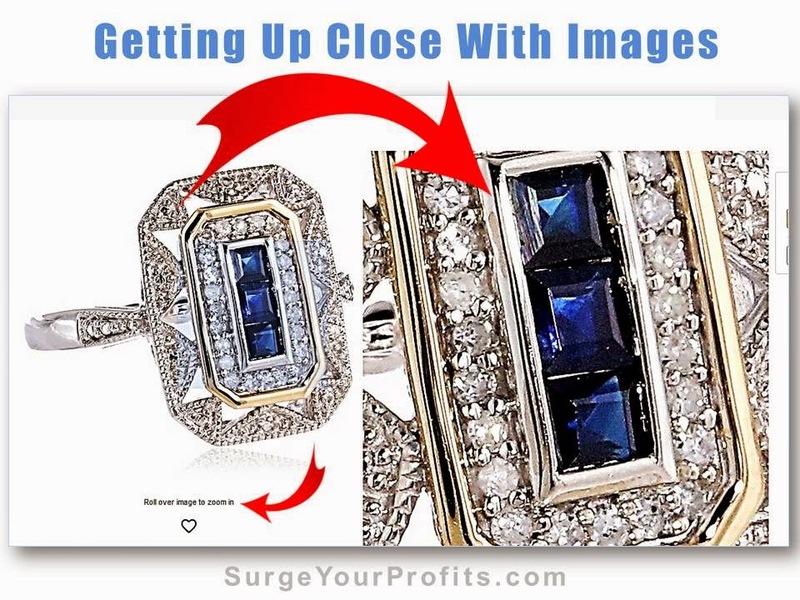 •Use of sharp, attractive images, gift set and accessories cluster/group photos (upsell strategy, fashion idea suggestions) for all their inventory - cf. blue arrows. Your audience is getting more and more visually experienced and sophisticated as well as demanding, thanks to the advent of devices with ever improving imaging and sharing ability. No need for giant images, just not too small, but definitely HD. Enable "mouse-rollover-of-image-to-zoom-in" feature to overcome size and speed of webpage loading issues without sacrificing customers' visual experience. This is especially pertinent for products with special or unique features you wish to highlight or are important aspects of a design or style (eg. fashion items) or has important usage instructions and / or content descriptions (eg. beauty or health products) as customers are increasingly diligent about reading product labels. The smaller red arrow shows the instruction to "roll over image to zoom in". Remember to optimise your images for Pinterest boards. Note that vendors are cottoning onto this and have replaced their original, smaller, product images for larger and more Pinterest-friendly sizes and colours that work well ie. these images are more eye-catching visually. •Micro-filter facility to fish out all the special offers from 'standard' gift sets to create-your-own customised versions (for the creative-minded) - cf. the yellow arrows. On the LHS valuable, online real-estate has been well utilised to host an inhouse, search-engine to drive detailed queries. Note that specific keyword queries (and not the general queries) tend to be "buying" ones and convert well. This is in addition to a general, webstore search engine well located at the top of the page for easy access. 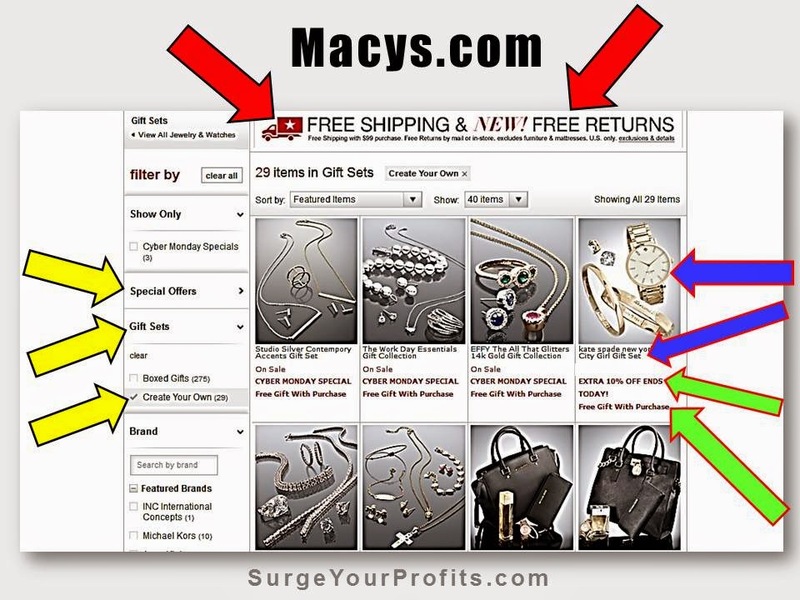 Indeed many large Webstores have good, micro-filters similar to the one above. •More savings options eg: "Cyber Monday Specials", "Extra 10% Off", "Bonus Offers", "Free Gift with Purchases" for individual items / custom lines / specific groupings - cf. green arrows. •Multicurrency: It displays the currency of your country should you drop by which is convenient for foreign buyers who do not have the hassle of having to use a currency-converter app or web-tool. Nothing to get in the way of stopping or impeding a sales conversion. This site uses many and different hooks to attract, retain and tempt visitors to browse and spend in an attractive, classy and convenient way. What shopper wouldn't want to shop with more style and convenience given their already hectic lifestyle, especially with all those freebies on offer? This site uses prominent rotating banners above the fold. This valuable real estate is well utilised because the multi-clickable banners are as functional as they are attractive. Sometimes these can be so large and glossy that they distract visitors without being directly useful (ie. the banners have no clickable links / areas). The banners on this site are clearly defined by category and highly relevant to the season: "Toys gift guide", "Last days for Christmas delivery", "Fabulous festive offers", "Last minute gift ideas". More importantly, they contain several, clickable links per banner, to various product subsets of this large, departmental store. However do make sure that your banners are centred (check out your webstore's views in different browsers and also in different sizes). This is a minor point but no better time than now to pay attention to detail - anything that will give you the edge over your competition. Billions of dollars will change hands within the next 4 weeks so make sure you get a good ROI for your total input. Don't forget the footer. This valuable space has been efficiently utilised by the same site. Check out the image above for the various shopping and reward options that not all large webstores have eg. links to instore mobile app, device apps to upsell / cross-sell / retain / engage shoppers via different channels whether smartphones, tablets, etc. These reward options also cultivate brand loyalty and offer valuable insights into your shopper's habits. More significantly they indicate that the store is capable of responding and adapting to the changing trends in shopping (shopper- & device-friendly) and that will surely impact their bottom line ... for the better.